Hidden away on a massive plot of verdant land in the north of Phuket island, the Phuket Elephant Sanctuary has been generating a steady amount of buzz since it opened in late 2016. Phuket’s first and only true elephant sanctuary, visitors have the unique experience to spend a morning or afternoon up close and personal with rescued and retired elephants in their natural habitat. Note : Beware of impersonators. There is only 1 real elephant sanctuary and visits can only be booked direct from their website or via Facebook (see links at the end of this page). You cannot book a visit via a tour agent or travel agent. I've not had the chance to visit myself - and I would like to, but they charge 3,000 Baht per person so it would be 12,000 Baht for my family and I to visit. For sure it's a worthy cause, but I was half hoping they might let this "famous Phuket blogger" have a free visit and help promote the sanctuary :) Ah well, dream on! Luckily I know someone who has visited and she does some freelance writing, so this Phuket blog post is written by my friend Amy Bensema who has been living in Phuket for many years. You can find Amy on Twitter (@girl_with_bear) and she also has an Instagram account (@Phuketstagram) where you can find lots of Phuket photos. The photos on this page were also taken by Amy. 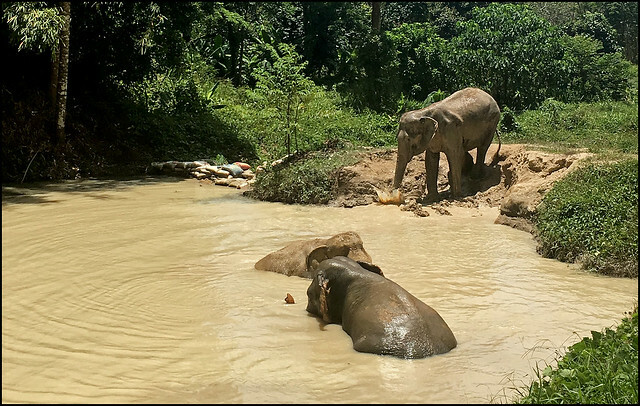 The Phuket Elephant Sanctuary is a fantastic initiative brought to Phuket in partnership with Elephant Nature Park, which is an elephant rescue and rehabilitation center in the northern province of Chiang Mai. The sanctuary endeavors to pioneer ethical elephant tourism by offering retired elephants the chance to live out the rest of their years in a nurturing environment where they are allowed to roam free. 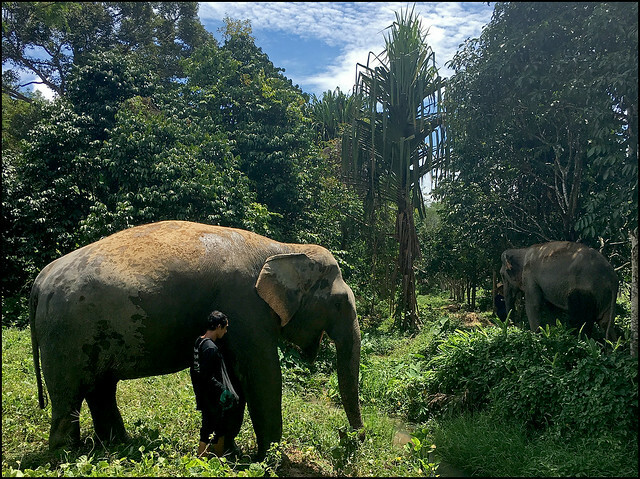 At its core, the Phuket Elephant Sanctuary is a retirement home for sick, injured, tired or old elephants who have spent their lives working long, exhausting hours in the logging industry or tourism entertainment fields so popular in Southeast Asia. This type of work is not only difficult for the elephants, but it is often conducted under extremely cruel and abusive conditions. A combination of these factors makes life quite unbearable and sad for an elephant. 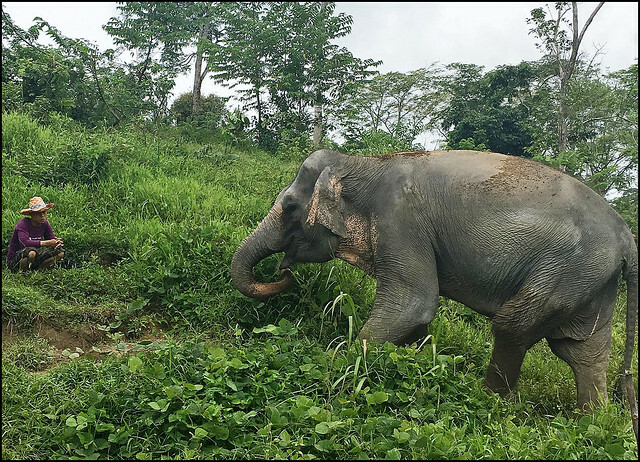 Currently, there are 6 lovely lady elephants that reside at the Phuket Elephant Sanctuary, and the best way to both meet and interact with them is through a morning or afternoon tour. Booking in advance is required as the tours tend to fill up quickly and you cannot just turn up and get to see the elephants. I have had the opportunity to join the morning tour at the Phuket Elephant Sanctuary on two separate occasions over the last year. Both visits have been equally informative, educational and enjoyable. The meeting point for the tours at the sanctuary is a quaint cafe called Monkeypod Coffeehouse. Here you can grab a strong cup of coffee before piling into the trucks that take you to Phuket Elephant Sanctuary. There is no public access to the sanctuary for safety and insurance purposes, which is obviously a great idea as the elephants roam free. Tours begin at the Tree Top Reception and Observation Platform and the introduction session is led by a member of staff. Visitors are given an overview of the vision and mission of the sanctuary as well as shown a short, documentary-style video that highlights the horrors of the elephant tourism industry. Although graphic, the video is a must-watch as it highlights why there is such a need for the Phuket Elephant Sanctuary. Interestingly enough, both times I joined the tour it seemed that most visitors were not aware of the hardships endured by many elephants in the tourism industry in Southeast Asia. 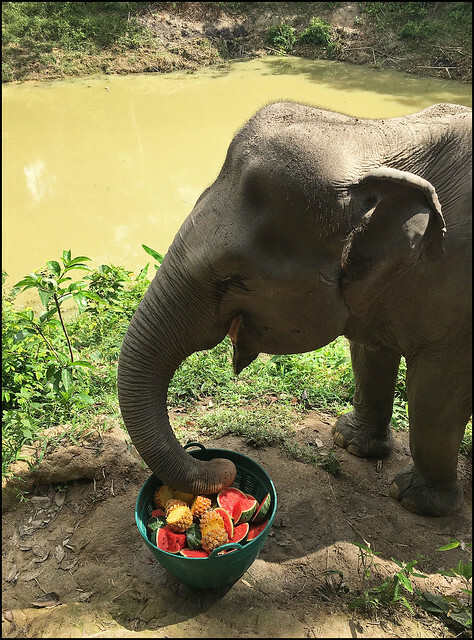 Education is key, and the Phuket Elephant Sanctuary does a good job of turning something negative for the elephants into a positive experience for both elephants and visitors. After a meet and greet feeding session with a few of the elephants, the tour kicks off in full swing. Separated into groups, visitors get the chance to wander the extensive grounds of the sanctuary and follow the elephants and their mahouts. Observing the elephants in their natural habitat is a real treat. The lovely ladies are quite playful in nature and occasionally throw mud and pull down rather large tree branches, however, it is lovely to watch them being carefree and having fun. A highlight of the tour is watching the elephants frolic and bathe in the lagoon on the sanctuary grounds. (above) Elephants certainly do enjoy the water! It is easy to see that the staff leading the tours are very passionate about their work. They truly love the elephants and share their knowledge freely and answer any questions as best they can. Mostly Thai, the staff are great conversationalists and really fun to be around for the duration of the tour. The tour is rounded out with a delicious, homemade lunch prepared by the staff. The food is all vegan or vegetarian and included in booking costs. There’s a small shop that sells t-shirts and handbags with the Phuket Elephant Sanctuary logo, and proceeds go back into the sanctuary. A morning or afternoon at the Phuket Elephant Sanctuary is highly recommended for those coming to Phuket on holiday as well as locals and expats residing in Phuket or Thailand. Unique, informative and fun, the tour offers a lot of insight into the importance of having such a sanctuary in Phuket. Plus, the elephants are sweet and charming and a joy to follow around for a few hours.